Eight of Pentacles wants you to allow yourself to experience your prudence and wisdom – your training has brought both discipline and skill. You have strong characteristics – prepare for your future – continue to study and learn your trade, skill or profession. You may not be receiving much monetary gain at this time but you are definitely on the right track. Continue to develop your abilities and refine your skills. Remain dedicated to your personal goal – it may seem far off, but you should continue to establish your power and use it wisely. Always keep your goal in focus – work on it even when it seems tedious. Staying healthy and whole requires constant change. Adapt to the ever-changing realities. Remain flexible, versatile and adaptable. Some situations will call on all your energy just to keep going, hoping for things to get better. The repetition of your activities gives you a sense of security. If you want to be recognized for your craftsmanship – you must be willing to undergo an apprenticeship to develop your strengths. You do things with the belief that they are worthy of your time and effort. Look forward to the future, plan your moves and prudently prepare things in advance. Keep yourself renewed, alert, creative and stimulated – unfold and begin to branch out. One form of learning is to take care of yourself and your own needs – get your finances and resources in order. Do not move in the extremes now by over-extending yourself externally – operate from your internal center. Your greatest skill is knowing both your medium and your message so well that you work in harmony with their natures and they function together at their best. You must care about your work, it must relate to the world. If it does not serve the community – it will lack any real meaning. The effect of the highest order of emotions on the Physical Plane – the physical aspires to the spiritual as indeed the spiritual has aspired to the physical. There is increase in productivity with the joy of proper work – your physical/material foundation itself moves forward. Pleasure in material things in a very positive sense as you begin to truly see and experience the pulse of God in nature and all things material, organic and inorganic. Your environmental support systems are in place and working – you efficiently identify with them as they are literally extensions of your self. Great enjoyment of physical exertion, whether work or leisure. Physical prowess. Dedicated, mature worker. Good use of power and resources. Thoroughness, precision – the physical level produces quality and quantity that surpasses individual needs, surpasses extended family needs offering the excess of its efficiency to the greater good of all who require it. This is the efficient use of material resources and manpower to the benefit of both. Teamwork, physically coordinated with others as group output takes priority. The stage is being set for the next step. Recognition and honoring of the physical origin (father) which is looking backward to the past together with the honoring of the product (son) which becomes the new physical origin with an eye to the future. An air of magic given to the efficient and prodigious output now possible. Questions to Answer: What are you working on or preparing ahead of time? What skill or craft are you learning? What details do you need to examine and take care of? How can you create a regular time and place to work? What are you doing to take care of your health and well – being? Four Pentacles in spread: There will be an increase in your finances and a feeling of great satisfaction. Next to Fool: Do not become careless in your work or finances just because things appear to be going well – there is need for caution. Next to Hanged Man: Strike while the iron is hot and do not be afraid to pursue your goal. In the first position: You are a master craftsman. You have the ability to harness the energy of love and understanding and use it in the material world. To achieve the paradox of using something and instead of depletion there is increase. Your ordered personal world will help bring order to the world at large. Seeing the handiwork of such a gifted man reinforces our closeness to God, for we know then that we are indeed seeing God. In the second position: You could be dropped in the middle of nowhere and in three hours have the natives organized and producing a product that would turn a third world backwater into a thriving member of the international economy. Resourcefulness – reserves. In the third position: Now is the opportunity to make concrete headway – work that you love and do well – get your team ready. In the fourth position: Your love will be to see the effect you can have on a raw process. Your ability to bring order and refinement to something that leaves it more beautiful and valid in every sense. You could be the missing link that makes something work. In the fifth position: You feel prepared, content that you are doing all that you can do to bring the present situation to its right conclusion. In the sixth position: With your involvement with your projects and your success, you must work even harder at how you interface with your loved ones and coworkers. For as much as they share your dreams and back you – they cannot know all that you know and feel all that you feel. In the seventh position: Your integration of spirit into your work produces amazing results, perhaps more amazing to others than to you. In the eighth position: The production line is running – get the boxes ready – it is time to package and deliver. Now you can see what all the talking has been about. Here is the latest model, the newest creation. 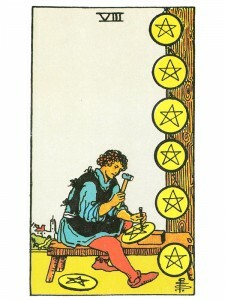 In the ninth position: You are very caught up in the work at hand, the activity at the physical/material level. When you are in your studio, you are in your heaven. In the tenth position: This is the mark of the professional, not the amateur or the apprentice. People will look to you for the best in your field of expertise. If you have been awaiting accreditation of licensing, it will be yours no latter than this time next year. For others already in gear, this will be a time to put your best foot forward. Your work will be right on target. 8 of Pentacles (“regarding someone’s feelings for another”) in the ninth position of beliefs, -to me, shows someone simply, routine, working on putting together and/or maintaining a practical relationship that is either family or business or another real-world relationship. It is the kind of relationship we are all familiar with, -that has a traditional structure. The relationship’s maintenance is not a task, nor a chore, -not even a whisper of resentment. Someone’s physical contribution, groceries or shelter or even one’s Presence provided in this relationship is maintained, as a matter of fact, in an orderly fashion, and the Querant is absorbed in this daily existence. The ninth position represents the hopes and desires you have for the outcome of your question. The eight of pentacles represents a forward movement/growth in all areas of the physical/material world – when you begin to unite the material world with the spiritual world. I would suggest that you trust your own wisdom for the answer to this question. Thank you very much, I have fixed the error and again thank you for letting me know the picture was wrong.